Accepts Connectors Up 1.18" / Cables From 0.35"-0.55"
For connectors up to Ø30mm (1.18"). Cables from 9-14mm (0.35"-0.55") The range provides waterproof cable routing through the deck and is produced in 316 stainless steel with options for 16mm to 40mm connectors. Tapered bung forms watertight seal. All units are supplied with a closed-cell base seal - 100% waterproof. Split-seal option does not require connector removal during install. Aesthetic dome-shaped profile provides a stronger, impact-resistant design and outer dome provides additional water shield. 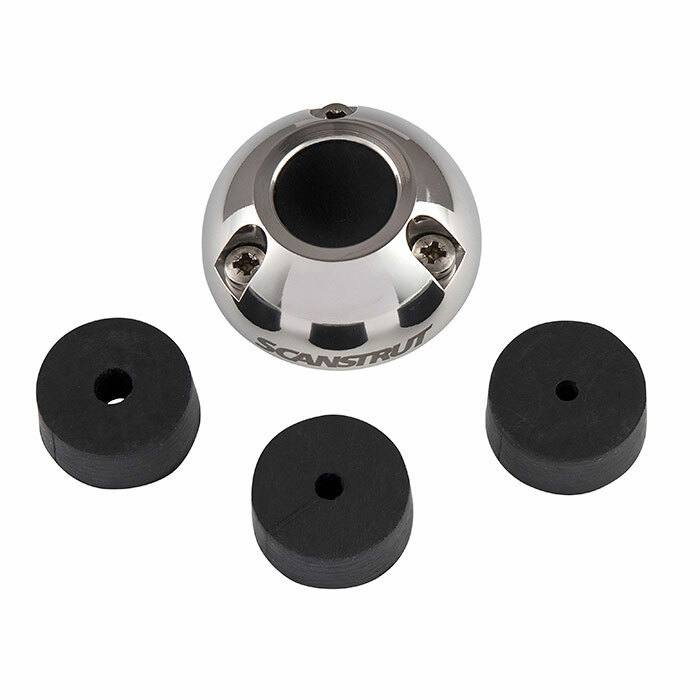 Captive nuts make for easy assembly and also allow reliable repeat installations. Each unit supplied with both pre-drilled and blank inner seals to make your installation as easy as possible. Complete Fixing Kit Supplied. Easy and Reliable Installation : Captive nuts make for easy assembly and also allow reliable repeat installations. Each unit supplied with both pre-drilled and blank inner seals to make your installation as easy as possible. Multi-functional Dome shape : Aesthetic dome-shaped profile provides a stronger, impact-resistant design and outer dome provides additional water shield. Accepts Connectors Up 0.63" / Cables From 0.08"-0.35"
Accepts Connectors Up to 0.83" / Cables From 0.17" - 0.31"
Accepts Connectors Up 0.83", Cables From 0.35"-0.55"
Accepts Connectors Up 0.83" / Cables From 0.35"-0.55"
Accepts Multiple Cables Up To 0.71"
Applications: Cable Diameters from 0.08"-0.35"